Christianity was introduced to Japan by St. Francis Xavier in 1549, and made marvelous progress after his death. Until 1588 there was open expansion in the Pacific. Then, in 1587, when there were 200,000 Catholics in Japan, a persecution began. Jesuit and Franciscan missionaries were crucified and others expelled from Japan by Emperor Tagosama, absolute ruler of Japan, who obliged his subjects to adore him as a god. Many missionaries, however, remained in Japan in disguise. After political revolutions, another persecution started in 1592. The news spread that all Catholics found in churches or harboring missionaries would be imprisoned. This raised such enthusiasm among the Catholics for martyrdom that the idolaters themselves were in admiration. The first to give the example of martyrdom was a General of the Army, Okondono. While he was at the house of his friend, the King of Bungo, he received the news of the edict and headed to the house of Fr. Nheke, a highly respected and virtuous Jesuit missionary, in order to die with him. In the house of Yanagihara, a noble from Bungo, all prepared themselves to die. Even the father, age 80, who had received Baptism a short while before, refused to flee. He remained, saying that he would die for Christ, but carrying his weapons as befitting an old soldier. 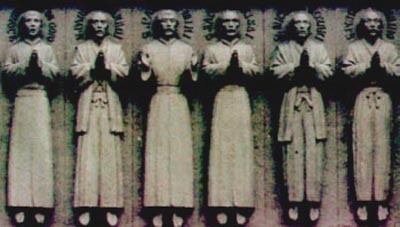 In 1597, 26 Catholics – six European Franciscan missionaries, three Japanese Jesuits and 17 Japanese laymen including three young boys – were executed by crucifixion in Nagasaki. On the way up the hill, a man tempted the youngest boy Louis Ibaragi, age 12, to renounce his faith. He would not yield but eagerly asked, “Where is my cross?” When they pointed out the smallest one to him, he immediately embraced it and held on to it as a child clings to his toy. 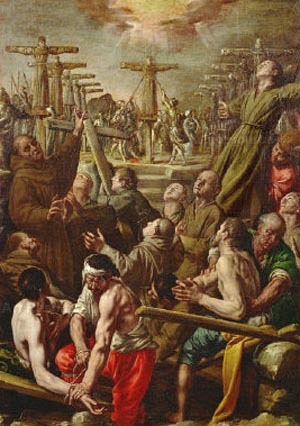 The martyrs were raised on crosses and then pierced through with spears. From 1597, the persecution spread at the instigation of the Protestants of Holland and England, who assumed in this way the role of Judas that they have often played against Catholics throughout the world. To eliminate the competition of the Portuguese and Spanish in their commercial relations with Japan, they encouraged the Emperor and the nobles to declare a war of extermination on all the Catholics in the Empire. A new wave of martyrs crowned the Church in Japan. Among them was Juliahota, a Korean illustrious by birth and virtue. She was very esteemed and favored by Prince Kubosama, who desired to marry her. When she saw the persecution coming, she made the vow of perpetual chastity to attract graces from Our Lord. The Prince, offended by this gesture, sent her and two companions – Lucia and Clara – to a faraway fishing village. There they remained for 40 years, abandoned by man but granted many celestial favors. At first, the noble maiden was sad because she thought she was not worthy to give her blood for the Faith. But after receiving advice in a letter from a Jesuit missionary, she understood that the Church also considered as martyrs some saints who had suffered exile. You see how many martyrs and how many examples of heroism this selection presents us. What a marvel that the news that Catholics would suffer martyrdom should receive such an enthusiastic reception! What faith! What a sense of honor they had! In a Christianity so far removed from Rome, so distant from the good examples of past Christendom, the reports of the coming persecution raised joy and a desire for Heaven. This indicates a flourishing general state of spirit in the nascent Church of Japan. In that preponderantly feudal Japan, several princes and nobles were such loyal members of the Catholic Church that they were willing to give their lives for her. 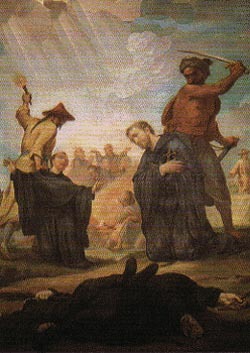 Even some who were close to the Emperor and had received his favors chose to seek out the persecuted Jesuit and Franciscan missionaries in order to die with them. How admirable was that Queen of a small kingdom, probably one of those Japanese islands, who prepared herself and her daughters with splendid new garb in order to receive martyrdom. You can picture the interior of a small royal palace, with a courtyard adorned with ornamental Japanese trees and small fountains, a garden with delightful surprises in each corner, small plants with red flowers, charming little animals scurrying here and there. And in a room opening to the courtyard, there is the Queen with her servants, calmly cutting and sewing her magnificent dress. She was preparing herself for martyrdom as she would prepare herself for a wedding. It is truly a beautiful manifestation of her faith, of how naturally she and her daughters lived the truths of our Faith. And how appropriate and venerable was that old officer, the head of the noble household who declared he would stay and die for Christ carrying his weapons! What can be said about that boy who resisted the invitations of his father to apostatize, and instead gave him a splendid sermon on his paternal and filial Catholic duties? He is a natural patron for those who have similar problems in their families. It is a pity that the selection does not give us his name, so that we could ask him by name to intercede in our needs. And how admirable of the courage of that other boy of 12 years who refused to apostatize, but instead embraced his cross on the hill of Nagasaki in imitation of Our Lord! Then, the beautiful and noble bride who renounced the favors of a powerful Prince, made a vow of perpetual chastity and prepared herself to die for Our Lord. But the Prince did not hand her over to death. Instead, he sent her and two companions to a rude place of exile among simple fishermen, far from everywhere. She spent 40 years there. You can imagine the scene. She sits along the waters at sunset, near that little village. 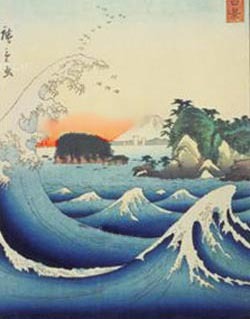 A red sun is falling into the ocean; at her feet is an ocean of small rolling waves, typically Japanese. She recalls with nostalgia attending a Mass, seeing and adoring the Holy Eucharist, receiving Communion, and considers how happy she would be to confess herself for her peace of conscience, even though it is pure. At the end, she serenely dies after a long exile that was a true martyrdom. Those were the fruits of the Catholic Church in Japan soon after its conversion. This selection does not say everything. After those initial persecutions, the Catholic Church in Japan was so intensively persecuted that one could say that she was drowned in blood. She was almost completely destroyed. Only a tiny stream of Catholics remained. It was a clandestine stream of Catholics who stayed faithful and continued to hold to the Faith until shortly before World War II. Some of the descendants of those heroic Catholics then came to the West, to Brazil, for example, and here they apostatized. Why did this happen? They could not resist our materialist and revolutionary environment of the enjoyment of life. It is a paradoxical reality, but it is undeniable. Those Japanese Catholics were able to resist centuries of religious persecutions by their pagan monarchs; however, they were not able to resist our revolutionary ambience of material progress. I know that in principle material progress is very good; I know that it can lead to God. But let us face a concrete fact: Those Japanese Catholics who remained faithful for centuries suffering all kinds of persecutions and privations, when they immigrated to a Catholic country and assumed our revolutionary progress - they apostatized. You can conclude from this fact whatever you want. Right now, I will not elaborate on it. I leave the conclusions to each of you. Let us ask the Japanese martyrs to enlighten us with a solution for this problem.